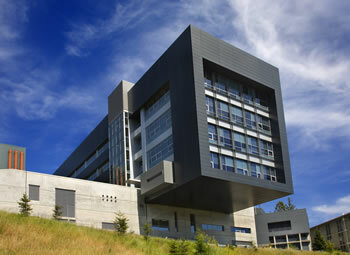 BERKELEY, CA  The Molecular Foundry, a nanotechnology research facility located at the U.S. Department of Energy’s Lawrence Berkeley National Laboratory, has received a U.S. Green Building Council Leadership in Energy and Environmental Design (LEED) gold certification. This is the first gold certification awarded to a building in the City of Berkeley. The LEED green building rating system is the nationally accepted benchmark for the design, construction, and operation of high performance green buildings. The Molecular Foundry’s gold rating — the second-highest ranking obtainable under the system — is based on the utilization of a myriad of features, including optimally designed electrical and HVAC systems, an energy-efficient chiller and boiler plant, and the innovative design of traditionally energy-intensive areas such as labs, a cleanroom, and a server room. Because of these and other measures, the Molecular Foundry consumes 28 percent less energy than the already-stringent California building efficiency standard, as mandated by Title 24. "We're honored to receive the LEED gold award from the U.S. Green Building Council," says Berkeley Lab Director Steve Chu. "It's particularly appropriate that one of the highest rankings for Leadership in Energy and Environmental Design should be awarded to a research facility partly devoted to the Lab's search for new ways to achieve an energy-efficient future and reduce the environmental impact of human activities." The Molecular Foundry also consumes 35 percent less energy than the national energy standard, as prescribed by the American Society of Heating, Refrigerating and Air-Conditioning Engineers’ (ASHRAE) standard 90.1. In addition, the facility produces 85 percent less greenhouse gas emissions than a conventional facility that meets the ASHRAE 90.1 standard. The Molecular Foundry was designed by the SmithGroup of San Francisco and constructed by Rudolph and Sletten General Contractors, working in close collaboration with Berkeley Lab staff. It was completed in March 2006 as one of five Department of Energy Office of Science Nanoscale Science Research Centers located throughout the country. The $85 million, six-story, 96,000 square-foot steel, concrete, and glass facility provides users from around the world with instruments and techniques to enhance their studies of the synthesis, characterization, and theory of nanoscale materials. It houses six facilities, and establishes a hub for collaborations among researchers from such diverse disciplines as materials science, biology, electrical engineering, physics, and chemistry. About 85 percent of all building construction waste was recycled. Almost all wood used was sustainably harvested as cer­tified by the Forest Stewardship Council. Rapid­ly growing renewable materials, such as bamboo flooring in the lobby and interaction spaces, are among the sustainable building practices. The Foundry’s six stories minimize the building’s footprint, and more than 50 percent of the site is landscaped with native plants. Prior to constructing the Molecular Foundry, Berkeley Lab measured electrical loads in three campus labs to obtain an accurate characterization of end-use loads. Mechanical and electrical systems in the Foundry’s labs were originally designed for 25 Watts per square foot. This was reduced to 15 Watts per square foot after the monitoring results were evaluated, saving more than $2 million in construction costs alone. The Molecular Foundry boasts good access to public transportation, and Berkeley Lab’s biodiesel-powered shuttle system minimizes car travel around the 100-building campus. Bike racks and showers are also available. Wind tunnel modeling of the Molecular Foundry and adjacent buildings was used to determine air exhaust and intake locations. An electromagnetic water treatment system on the cooling towers reduces total water consumption and the amount of chemicals released to the atmosphere and the sewer. Indoor air quality elements include carbon dioxide monitoring and control of outside air for ventila­tion, clean construction and commissioning practices of the ventilation systems, and use of materials that have low VOC (volatile organic compound) content and low VOC emissions. The Molecular Foundry is one of only three Department of Energy Office of Science facilities to receive LEED gold certification. It also has one of lowest electricity intensities of the 56 projects included in the Laboratories for the 21st Century database, which is an Environmental Protection Agency and Department of Energy program dedicated to the development of sustainable, high-performance, and low-energy labs.